Charlie Sharpless had a problem to solve. He was finishing his post-doctoral fellowship and wasn’t quite sure where to go next. He loved teaching and conducting research, but there were few positions at large research universities where he could mix these two elements. But with the University of Mary Washington, he found the perfect chemistry. Professor and Chemistry Department Chair Charlie Sharpless receives the Distinguished Research Award from the Virginia section of the American Chemical Society. As a professor and chair of the Department of Chemistry, Sharpless combines equal parts teaching, advising and research to make new discoveries in environmental chemistry and educate the next generation of scientists and industry leaders. Now he is being honored with the Distinguished Research Award by the Virginia section of the American Chemical Society at its annual award ceremony in Richmond on Thursday, March 21. 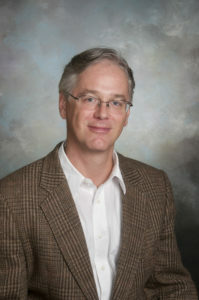 “I’ve never done research thinking about awards – it’s always been strictly for the enjoyment – but it’s an honor to be recognized, particularly for the success I’ve had working with my students over the years,” said Sharpless, who came to UMW in 2004 after earning a Ph.D. in analytical chemistry from Duke University and a B.A. in natural sciences from Johns Hopkins University. For the last two decades, Sharpless has studied environmental aquatic photochemistry, exploring the chemical reactions that happen when sunlight is absorbed by dissolved organic matter in the water. He’s discovered that simple measurements – such as the “brown-ness” of the water – can make accurate predictions about the rates of contaminant degradation. “I’m trying to understand how fast pollutants go away in the environment when the sun is shining,” said Sharpless, who has taken samples from clean bodies of water such as rivers, lakes and coastal marine systems, and studied the photochemistry that takes place during oil seeps and spills. Matt Walters ’16 and Charlie Sharpless inspecting an oil sampling net in the Gulf of Mexico. His work with collaborators at the Woods Hole Oceanographic Institution in Massachusetts led to an opportunity to study the effects that photochemistry had on degrading oil in the Deepwater Horizon spill in 2010. Sharpless and Matt Walters ‘16 later traveled to the Gulf of Mexico to capture oil samples. Their research, which was funded by the National Science Foundation, has provided scientific insight to the federal government and industry leaders who are responsible for cleaning up after environmental disasters. Professor and Chemistry Department Chair Charlie Sharpless with July Laszakovits ’16 and Orlando Stewart Jr. ’15. Photo by Norm Shafer. Earlier in his career, Sharpless worked with the Environmental Protection Agency and water utilities to discover how ultraviolet radiation can be used to disinfect and destroy contaminants in drinking water. And he’s also studied how photochemistry affects the breakdown of pharmaceuticals that flow from wastewater plants to rivers. While Sharpless is eager to “jump back into the brown water” and research with his current students once the Jepson Science Center expansion is complete, he acknowledges that he couldn’t have earned this award without the significant contributions of his former students.